14 Ken Lawrence/Michael Carruthers finished 2nd. Try as they might they could not close down the flying green machine. 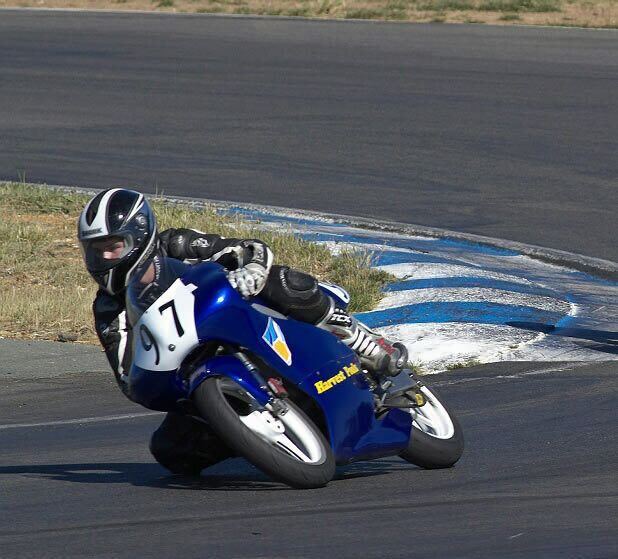 As Michael got used to the booming 4 stroke he got quicker and he was the only other rider to get into 1:11s bracket. The 97 Tyler Bradford/Aaron Morris bike finished in a fine 3rd place after an exciting dice with the # 14 pair. An impressive ride from both riders. (Tyler pictured). Fred Holland did the 2nd stint to take the chequered flag. 69 Ian Gregory/Ryan Young took 2nd place honours in the Superlite 1 Hour. 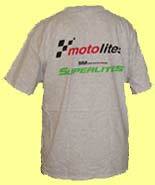 38 Walter Murphy/J.Murphy finished in 3rd place in Superlites. The bucket 1 hour enduro race, a great event just gets better every year. This year was no exception with exciting sprint racing and all the 1 hour races across the various classes, put on some spectacular racing. 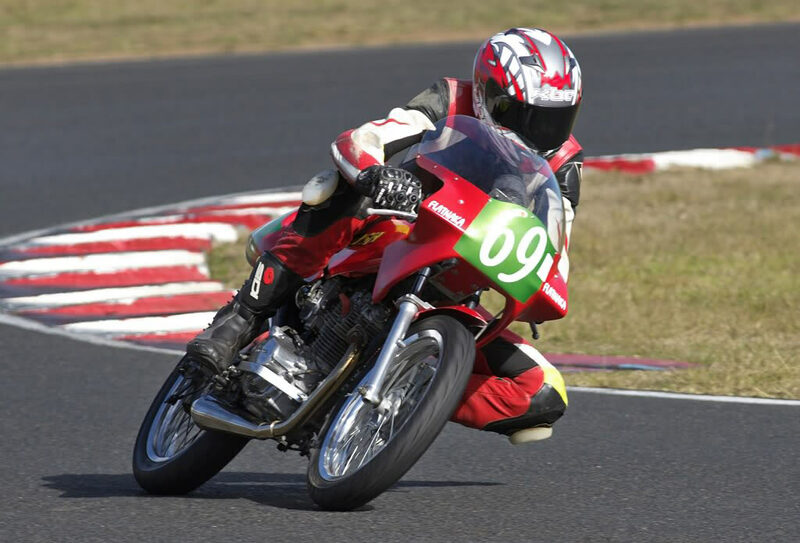 The weather obliged with two beautiful days of sunshine, a track in great condition and slick organisation by the PCRA made for an enjoyable weekends racing. 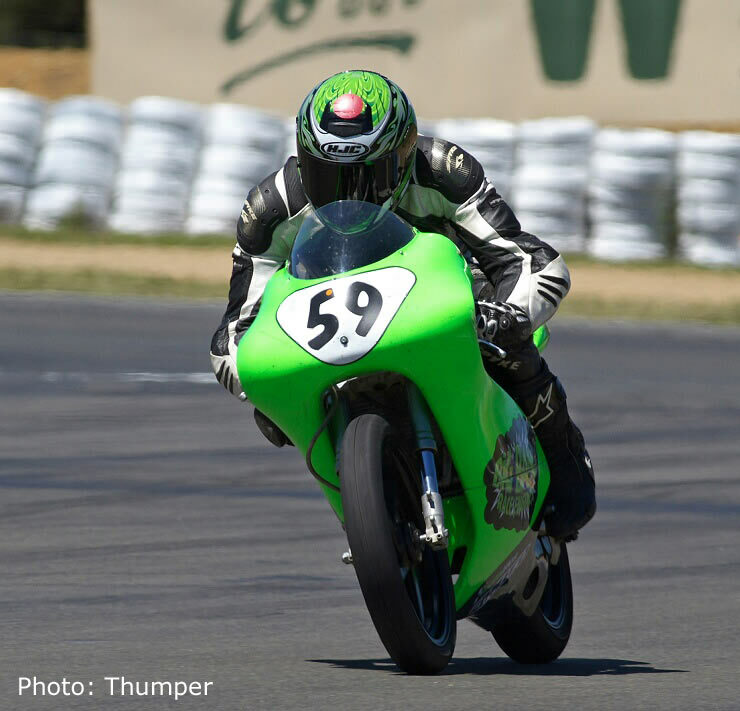 Qualifying for the one hour Motolite, Superlite and P45 got under way on Saturday and it was evident that a lot of people meant business which bode well for some good racing to come. # 93 Paul Borg set a cracking qualifying time of 1:12.2550, two secs. clear of the # 59 Garry Briggs/Stephen Byrnes machine who in turn was a full second ahead of the #14 Ken Lawrence/Michael Carruthers bike. Tyler Bradford # 97 was going well in 4th just .0250 behind the #14 machine, with # 68 Shane Wilcox/Neil Carlisle another second back followed by the #79 Stephen Kairl/Lech Budniak bike. Next came the first Superlite, none other than the #2 Ken Lindsay/Mark Strong Hawkesbury Honda RCB150 (Last Years winner and Lap record holder) doing an incredible 1:20.6350 almost 2 seconds up on their previous best. 1. # 93 Paul Borg/Nicky Diles (Chris Sculley tuned Honda RS85cr) Mot. 2. # 59 Garry Briggs/Stephen Byrnes (Big Bang Engines Honda RS150CRFr) Mot. 3. 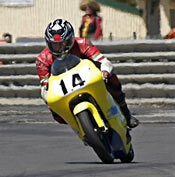 # 14 Ken Lawrence/Michael Carruthers (Hunter Toolup Honda RS150CRFr) Mot. 5. # 68 Shane Wilcox/Neil Carlyle (Chris Sculley tuned Honda RS85cr) Mot. 6. # 79 Stephen Kairl/Lech Budniak (Moriwaki 80) Mot. 7. 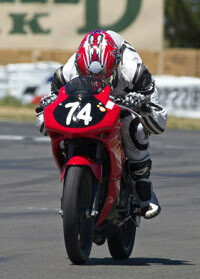 # 02 Ken Lindsay/Mark Strong (Hawksbury Honda, Honda CBR150) Sup. 8. 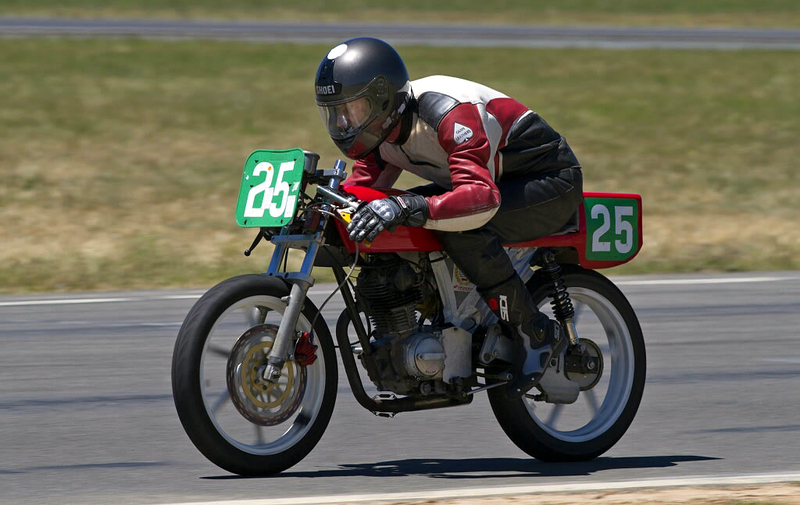 # 25 David Phillips/Fred Holland (Honda CB150) Sup. 9. # 10 John Skeers/TBA Mot. 10. # 43 Dan May/Mathew Lane (Honda 150) Sup. 11. # 63 John Skeers/Bob Murphy (Honda Sly 200) Mot. 12. # 15 Peter Macmillan/J. 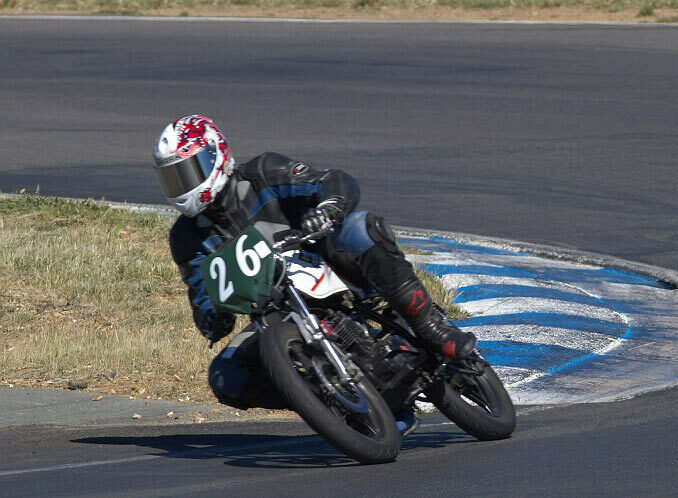 Clissold (Honda 125) Sup. 15. # 52 Michael Murray/Dennis Brown (Kawasaki 100) P45. 16. # 38 Walter Murphy/Jim Murphy (Honda 150) Sup. 17. 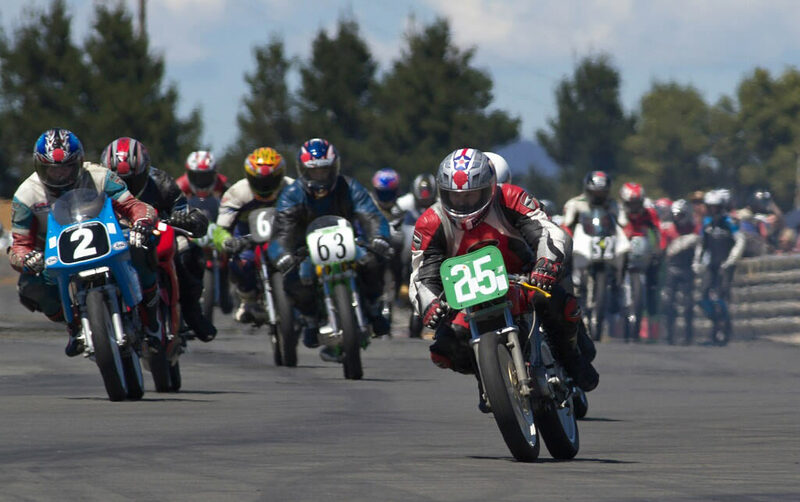 # 86 D. Miller/Jeff Brown (Honda 125) P45. 18. # 94 Tim Smith/John Olip (Moriwaki 85) Mot. 19. # 26 Nathan Shoesmith/Michael Lemon (Suzuki 159) Sup. 20. # 41 Peter Wade/Max Paterson (Moriwaki 80) Mot. 21. 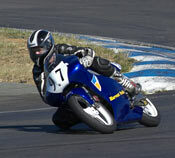 # 71 Troy Galvin/Jason Brett (Honda 125T) Sup. 22. # 08 Peter Waldron/Scott Waters (Suzuki 125) P45. 23. # 84 Terry Fenton/Brett Fenton (Honda 150) Sup. 24. # 66 Ian Stacey/Melinda Nash (Kawasaki 100) Sup. 25. # 85 Martin Kopp/Suzii Stevens (Suzuki 125) P45. The # 81 Lindsay McKay/Carlyle Bennett (Honda H100) had struck piston problems and only managed 3 slow laps before pitting for repairs, thank goodness the 1 hour race was on the following day as others had also struck problems. The # 14Ken Lawrence/Michael Carruthers team were trying to solve a rear wheel bearing problem and Jeff Clissold had a rare get off in a sprint race but not on the one hour Superlite machine. Stephen Byrne Co-rider on the green # 59 Garry Briggs machine also had a fall due to a suddenly deflating front tyre but no real damage to bike or rider. Early Sunday morning had the track shrouded in mist but it soon cleared away to another sunny day, perfect for racing. With only Sunday warm-up practice and leg 3 for Superlite’s and Motolite’s to do before the 1 hour it looked like being a leisurely morning. Not so for # 15 Jeff Clissold while leading the Sprint Race leg 3 on lap 3 his engine started blowing smoke and threatened to self destruct. So he was out of the race but worse still the 1 hour race start was too close for comfort and as soon as the bike was back in the pits he set about changing to his spare engine. This is where the spirit and camaraderie in bucket racing is evident as friends and competitors alike pitched in to help and with time to spare it barked into life and it all sounded good. Sighs of relief in the Clissold pits. The # 81 Lindsay McKay/Carlyle Bennett (Honda H100) was also ready to do battle and they were both confident that it would go the distance. Le Mans Start An unusual shot of the riders running to their machines. # 97 Tyler Bradford and # 59 Garry Briggs followed by # 79 and # 68. # 14 jumped into the lead for 2 laps but Paul wasn’t having any of it and was back in front. # 14 Ken Lawrence, # 97 Tyler Bradford, # 79, # 68, on lap 6 and they stayed in this formation until lap 20. In the meantime bike # 97 was the first to change riders on lap 18 followed by # 14 on lap 20, neither of them lost their position with the rider changeover and # 14 had the quickest rider changeover lap of all competitors. When the # 93 went to lap a slower bike at turn 5 he got pushed wide ran out of road and had to do some Moto crossing before regaining the track, losing enough time for # 59 Garry Briggs to regain the lead. The chase was on in earnest now but on lap 22, at turn 8 Paul lost the front end and went down. Bruised and shaken but otherwise okay Pauls race was run. This brought out the pace car for 4 laps and there was some confusion as to when to restart. Some riders chose the Safety Car period to pit for their rider change but in the end it all worked out okay. When racing resumed # 59 with co-rider Stephen Byrnes on board was the clear leader and # 14 with Michael Carruthers now riding immediately attacked the # 97 with co-rider Aaron Morris on board and took 2nd place. 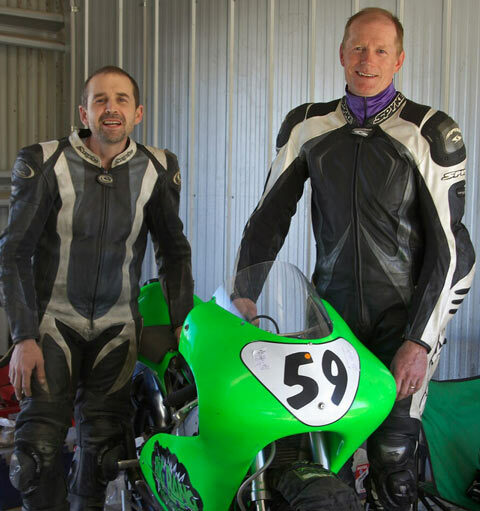 The # 59 machine ran out the winners again this year with co-rider Stephen Byrne (Right) reeling off many laps in the high 1:11s and low 1:12s with a new lap record of 1:11.4720. # 59 covered 49 laps same as last year but without the safety car delays most machines would have done at least another lap. # 14 and # 97 battled all the way to the finish with only 27.9 sec. between them after 1 hours racing finishing 2nd and 3rd respectively. # 79 co-rider Lech Budniak rode hard to keep the # 79 machine in 4th place and and the # 41 Paul Wade/Max Paterson combination rode consistently to come from 20th on lap 1 to finish 5th. The # 74 Ron Carrick/Alex Pickett CBR125 Commuterlite finished an incredible 6th in the Motolite class, 8th overall with Alex (Left) punching in an impressive 1:22.5950 lap time on lap 35. This bike was giving away something like 15 BHP to the faster Motolites. This bodes well for the future of Commuterlite Bucket racing the cheapest way into any form of motorsport. # 68 Shane Wilcox/Neil Carlyle made up for pit stop problems to finish 7th with the # 94 Tim smith/John Olip Moriwaki 80 breathing down their necks 12 secs behind in 8th. And the # 63 John Skeers/Bob Murphy Sly200 classified 9th. The field lined up for the Le Mans Start with the second rider keeping the bike running in neutral. When the flag dropped 27 riders charged across the track, kicking the bikes into gear and away. Mostly it was a clean start but # 15 Peter McMillan and # 69 Ian Gregory got tangled up resulting in the # 15 bike lying on the track with the field streaming away losing 3 laps before Peter finally got away. The Superlites get away # 25 David Phillips and Ken Lindsay lead the charge. First lap around fast starting # 25 David Phillips led from # 43 Dan May and # 2 Ken Lindsay followed by # 81 Lindsay McKay, # 69 Ian Gregory, # 38 Walter Murphy and # 26 Nathan Shoesmith in 7th place. On Lap 4, # 81 Lindsay McKay after some neat passing moves went into the lead from 4th and put the hammer down. The order stayed much the same until Lap 10 when # 2 Ken Lindsay Last years winner went down on corner 10 and wasn’t able to continue. This moved everyone lower than 3rd up one place. Meanwhile the # 15 Peter MacMillan/Jeff Clissold (9th) bike pitted on lap 16 the first Superlite to pit for a rider swap followed by # 84 Terry Fenton/Brett Fenton (10th) on Lap 17. Next to pit for rider change on lap 18 was 5th placed # 38 Walter Murphy/J. Murphy who did the quickest Superlite rider change over lap. Next in was # 26 Nathan Shoesmith/Michael Lemon, they were in 8th place. Suddenly on Lap 20 there was drama for the leader # 81 Lindsay McKay as he brought the ailing H100 back to the pits. It had blown a piece out of the crankcase near the transfer ports but in true never give up Bucket racing spirit Lindsay and Lyall set about some hasty repairs. # 43 Dan May had also gone missing and wasn’t able to continue. This moved everyone up two places but more drama Paul Borg crashed out of 2nd place in the Motolite class and the pace car was deployed. The pace car stayed out for 4 laps and amidst some confusion the race restarted. The front running Superlites hadn’t pitted yet but on lap 23, # 69 Ian Gregory/Ryan Young (2nd) bike pitted and the leader # 25 David Phillips/Fred Holland were in and away. 8th # 84 Terry Fenton/Brett Fenton. At the finish the # 25 David Phillips/Fred Holland duo were in a class of their own winning with 2 laps in hand. # 69 Ian Gregory/Ryan Young pair had to overcome their Le Mans start collision with # 15 and they steadily worked their way back into contention. # 38 The Murphy father and son duo Jim and Walter rode a steady, stay out of trouble race and finished strongly to get a fine 3rd place. The # 26 Nathan Shoesmith /Michael Lemon (Right-->) pairing worked well keeping out of trouble and being rewarded with a well deserved 4th place. The # 15 Peter Mac Millan/Jeff Clissold pairing lost 3 laps at the very beginning of the 1 hour and in the end they were 4 laps down on the leader. If they hadn’t such cruel luck at the very start, who knows what might have been. They still recoverd to 5th place. 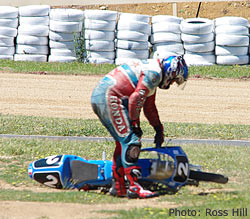 Of course the other hard luck story was the # 81 Lindsay McKay/Lyall Bennett machine. to strike trouble while enjoying a sizeable lead was cruel luck indeed. 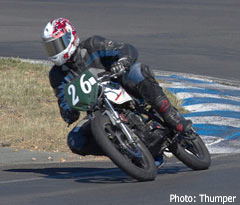 After Lyall and Lindsey had repaired the crankcase Lyall continued on to finish 6th albeit 5 laps down. # 71 Troy Galvin/Jason Brett brought the great sounding twin to 7th place. The # 84 Terry Fenton/Brett Fenton duo were running strongly at the half way mark but faded towards the finish but finishing a 1 hour is no mean feat. And so ended another Bucket one hour race with the usual hard luck stories and and stories of success. 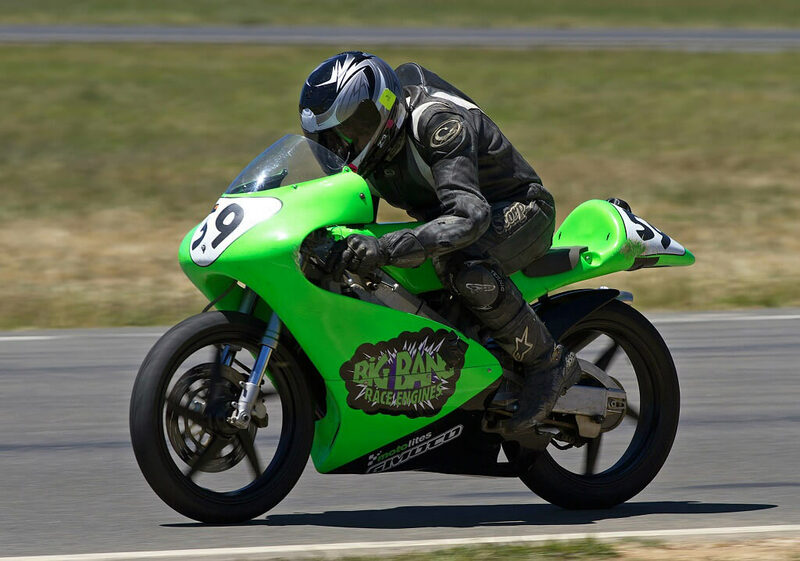 The Garry Briggs/Stephen Byrnes, Ken Lawrence/ Michael Carruthers, Tyler Bradford/Aaron Morris and Paul Borg/Nicky Diles pairings put on a fine a display of good close hard racing that you would see in any category. 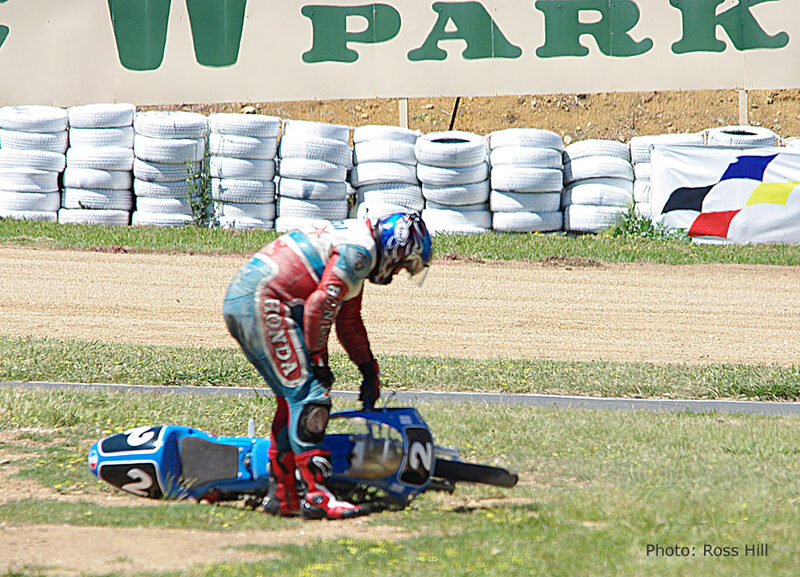 A shame for Paul Borg to crash out it may well have been a different result, as he was very competitive. Wishing Paul a speedy recovery. 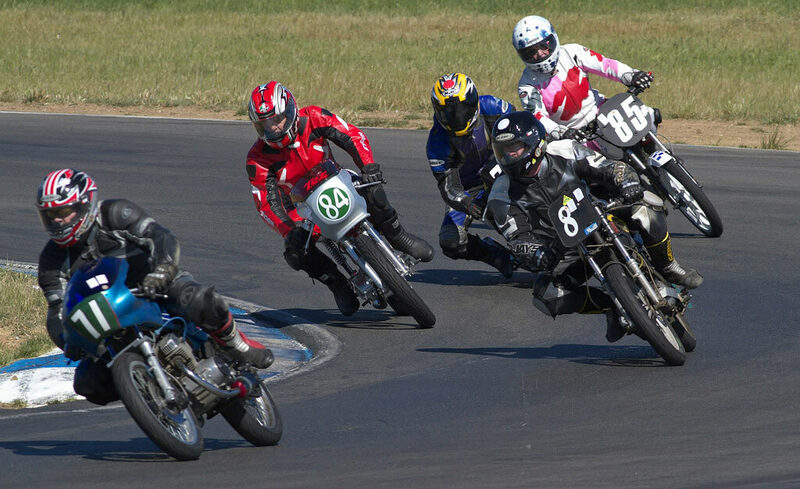 The Superlites put on a great show with the #25 Fred Holland/David Phillips bike being right at the front from the get go harassing the superquick # 81 Lindsay MacKay/Lyall Bennett 2stroke until it struck problems. The pace was such that the King went down and couldnt continue, # 43 Dan May fell by the wayside and the # 15 peter McMillan/Jeff Clissold pair were never in the hunt after their start line incident. No doubt the ifs and buts will be mulled over for some time. 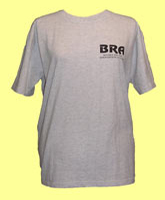 Looking forward to a new season and hopefully more of the same. Winners are Grinners. Stephen and Garry have that winning grin.